It sometimes seems that the flight path of a golf ball is determined not by the laws of physics but by Murphy’s law: what can go wrong will go wrong. The best golfers, therefore, are those who minimize Murphy’s intrusion into their game. One of these is Nathan Smith ’01, a four-time All-American at Allegheny, where he led the Gators to four appearances in the Division III national championship. More recently he won a spot in the Masters, the most prestigious tournament in professional golf, by winning the Mid-Amateur Championship for amateurs age 25 or older. He was paired for the Masters with Arnold Palmer, the 74-year-old legend who was making the last of his fifty consecutive appearances in the tournament he won four times. Smith had played with Palmer once before at a competition between pros and amateurs at the course Palmer owns in his hometown of Latrobe, Pennsylvania. But this was not the same. 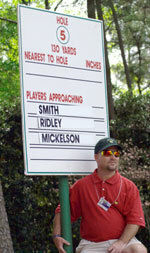 The Masters is one of the biggest pressure cookers in all of sports, and this was Smith’s debut in major competition. These were unusual circumstances indeed. Palmer had announced before the Masters that this would be his last. As a result, television cameras tracked Palmer’s every move. As they tracked Palmer, they tracked Smith. Like many of the competitors, Smith did not make the cut, which weeds out players after two rounds. He missed by two strokes. Palmer also missed the cut. Smith first picked up a golf club when he was three or four years old. “My parents played golf, and I was kind of always around it,” he says. Though he also played baseball and basketball, he eventually settled on golf as his principal sport. He picked Allegheny despite interest from Division I schools that would have offered an athletic scholarship. He says he was drawn to Allegheny for its scholastic reputation and its balanced approach to athletics. “The academic quality of Allegheny speaks for itself,” he says. And he wasn’t sure he wanted to play in Division I, where athletes are often treated as a commodity with little regard for their welfare. At Allegheny, Smith was able to compete as a freshman and was allowed to develop at his own pace by then-coach Rick Creehan, now athletic director at Washington and Jefferson. Many amateurs who win a spot at the Masters never make it on the pro tour. But there are exceptions. Arnold Palmer, for instance, won a berth in the 1955 Masters by winning the U.S. Amateur Championship the year before. 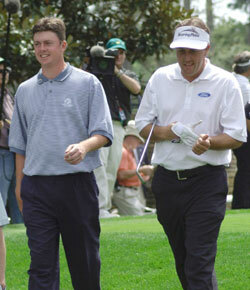 For those amateurs who do win a spot at the Masters, it’s an instant taste of the professional life. The perks, for example, are considerable. These include the sumptuous buffet at the regal Augusta National Golf Club in Atlanta, where the event is held. This article was featured in the Summer 2004 issue of Allegheny Magazine.